Ethnic estimates by percentages are notoriously misleading. 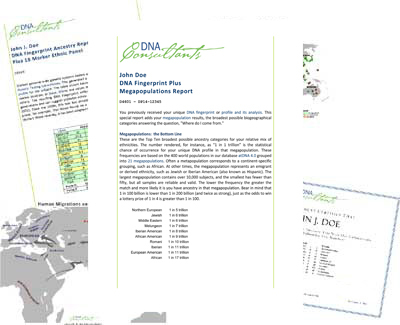 But you get the next best thing in your Megapopulations Analysis, included with every DNA Fingerprint Plus. Now you can get a special Megapopulations Report as a stand-alone product. For only $99 you find out your top ethnic matches (such as American Indian, Northern European, Jewish) and can always upgrade to the full product at any later date. The new Megapopulations Report is a great way to start small with DNA testing with the most important breakdown of your background and ethnic mixture. It also makes a great gift! Bear in mind that 1 in 100 billion is lower than 1 in 200 billion (and twice as strong), just as a chance of winning a lottery prize of 1 in 4 is greater than 1 in 100. While it is not possible to Megapopulationsextrapolate percentages, you can get an idea of the most important megapopulation matches and their relative value to other ancestries by looking at the Random Match Probability or match likelihood number. For instance, from the example shown, we can infer that the person primarily has Northern European roots and belongs to the emigrant population European American (U.S. and Canada). We can also get a notion of what ancestry is not featured prominently in their mix–evidently there is no American Indian, Romani, African or Asian since these megapopulations are not in the top matches but presumably in the lower range.